These valuations have been extracted from the Kering Environmental Profit and Loss (E P&L) Methodology and 2013 Group results report. Kering is a leading brand developer in the apparel and accessory sectors, working with brands including Gucci, Bottega Veneta, Saint Laurent, Alexander McQueen, PUMA and others. Kering’s report has been developed with support from PwC, and aims to assess and value, in monetary terms, the costs and benefits generated by Kering’s environmental impact, both within its own operations and across all of its supply chains. This includes the impacts of raw material extraction, manufacturing and delivery of products. Kering open-sourced its methodology in an attempt to encourage other organisations to do the same for their own supply chains. At the same time, PwC open sourced its valuation methodologies which are incorporated in these results. It makes use of the recently developed Environmental Profit & Loss (E P&L) accounting method pioneered by Kering. Like Social Return on Investment (SROI), E P&L aims to place a monetary value on aspects of an organisation’s impacts which are not traditionally valued. For example, the impact of air pollution produced in Kering’s own operations and across the Group’s supply chains has been valued at €64.5 million for 2013. Valuing these externalities makes it possible for an organisation to identify the operational areas which create the largest environmental “losses,” and make improvements accordingly and more effectively. This not only creates an opportunity for improving the sustainability of an organisation, but allows for increased transparency and reductions in risks like resource scarcity and climate change. To learn more about EP&L accounting, click here. Section 1 also outlines the supply chain tiers against which environmental impacts will be measured. This will allow for Kering to identify which areas of their operations create the largest environmental impacts. In section 6; “Determine valuation,” a combination of primary and secondary data sources have been used to create valuation coefficients, all of which are specific to Kering’s activities. These coefficients are defined by Kering as an “economic value used to express the consequences on peoples welfare of emissions or resource use in a given location” (p98). 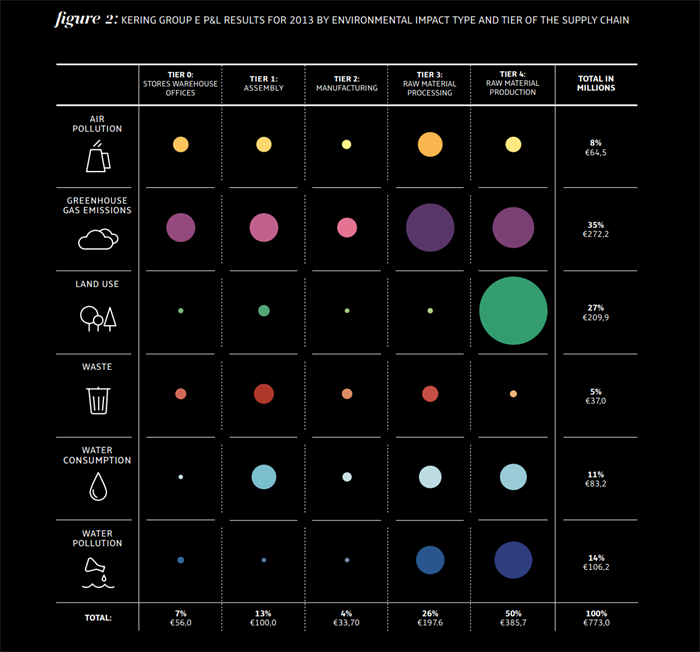 Separate coefficients have been developed for each of the environmental impact types identified by Kering, with methodologies for each outlined in the report. The valuations Kering uses represent the changes in human wellbeing resulting from environmental degradation. So, in order to value "change in air pollution," Kering have used four separate valuations of how human wellbeing suffers as a result of different airborne pollutants (PM, NOx, SOx, VOCs and NH3). A range of different valuation techniques have been utilised in this report including: willingness to pay, willingness to avoid, revealed preference and cost/income valuations. It’s interesting to see that valuations calculated using these various methods have been combined to produce the coefficients. We were only able to upload valuations which were expressed as €s per unit, for example, €s per kilogram of cotton produced or €s per tonne of CO2. Although all valuations calculated as part of the E P&L are weighted averages based on Kering’s activities and only strictly applicable to them, we nonetheless felt these would provide useful information for many users of the Global Value Exchange. Valuations which were expressed as a total for the whole organisation (e.g. total CO2 emissions produced annually by Kering, multiplied by the coefficient) were not uploaded to the Global Value Exchange. 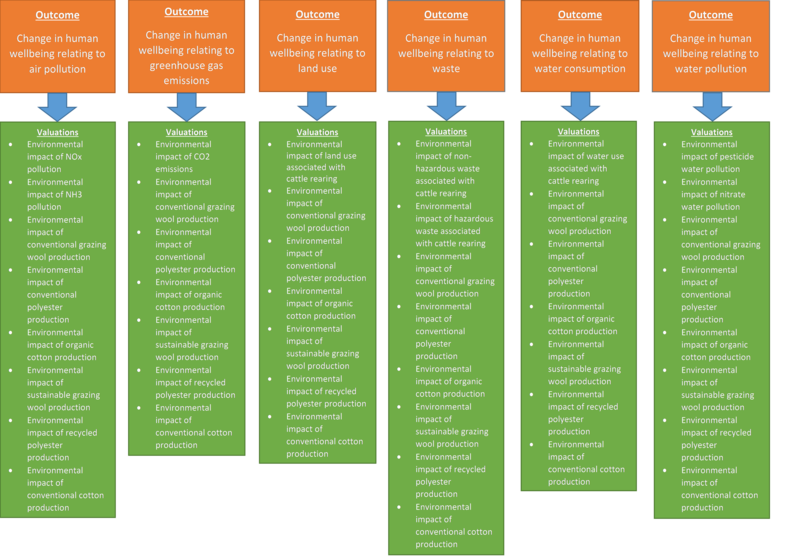 The valuations which relate to production of wool, polyester and cotton have been linked to each of the six outcomes, as each these measure the total “losses” incurred across all environmental impact types. All the valuations we’ve uploaded from the Kering report can be accessed on the Global Value Exchange by searching for “Change in Human wellbeing” in the search box.